It is Music in Our Schools Month, and the sweet sounds coming from Thoroughgood Elementary School are those of students learning to play ukuleles. 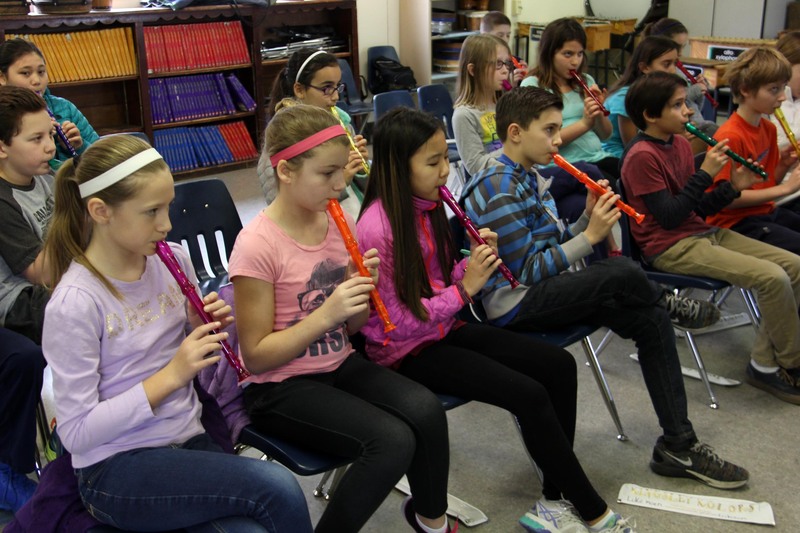 “Some kids don’t like the recorder,” said music teacher Cris Pelausa about what is typically used in music classes to teach note reading. “So, they’re a little more motivated to learn the notes. It’s a lot of fun, and I find that I reach kids I normally wouldn’t have,” Pelausa added. 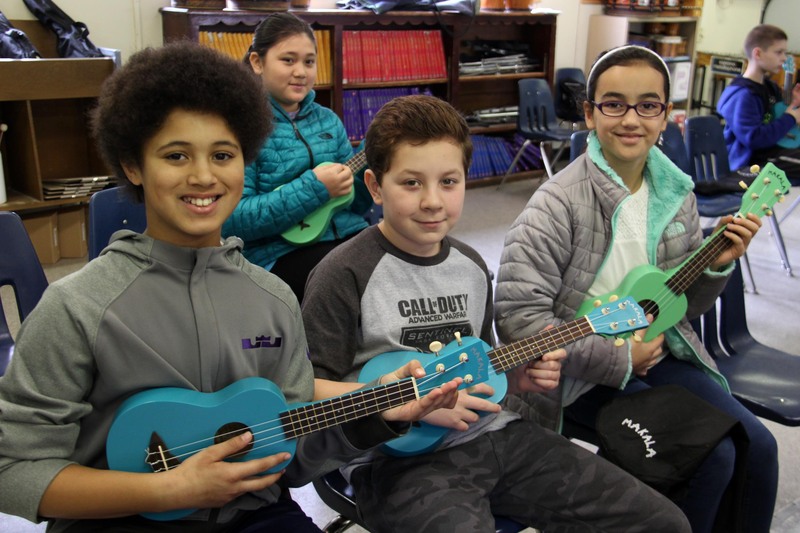 Thoroughgood students are still learning to play recorders; however, the class set of ukuleles provides Pelausa with another means of building music literacy skills. 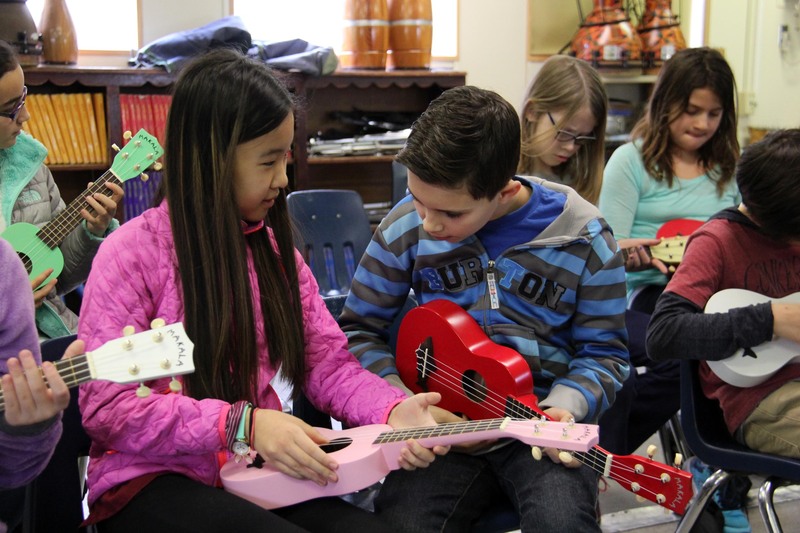 Note reading, rhythm reading, ensemble playing and critical listening are among the skills Pelausa highlighted in the Virginia Beach Education Foundation (VBEF) grant application he submitted in the fall to develop a ukulele instructional unit. Pelausa was awarded $1,700 in grant funding by VBEF supporter Quality Stone Concepts to purchase ukuleles and music. In addition to music skills, learning an instrument such as the ukulele can also help foster social-emotional development, according to Pelausa. “Students develop self-confidence and self-esteem as they progress in their playing and master repertoire. In a social setting, students act as each other’s teachers as they help each other with difficult chords and passages to learn and perform songs. Finally, students will learn what it means to be in an ensemble by developing concerts and performances which will hopefully encourage them to continue their musical education in secondary school,” Pelausa explained. 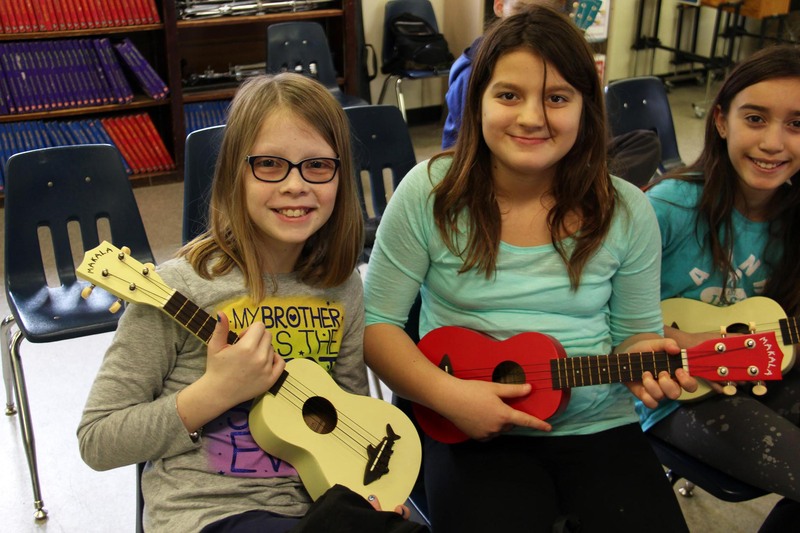 Fifth-graders have been playing ukuleles in their weekly music class since November. Pelausa also has used the instruments in his fourth-grade classes and with some third-graders. The size of the ukuele makes it ideal, according to Pelausa. While guitars have to be sized for students that they then outgrow as they grow, the ukulele is a one-size-fits-all instrument. 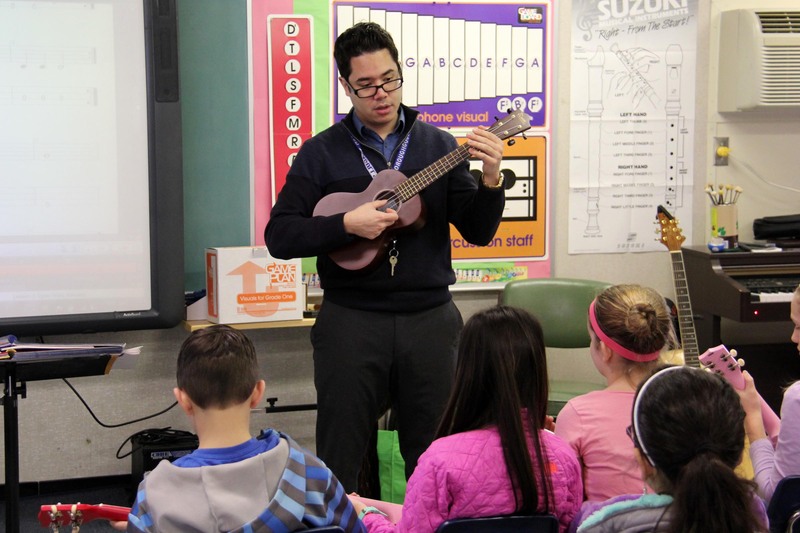 Using a larger baritone ukulele so students can more easily see Pelausa’s playing, he leads one fifth-grade class through the first exercise of the day after quickly tuning all of the instruments. “Now, place your left hand holding the neck of the instrument,” he began. “You see I put my thumb on the C-string. The C-string is the third string. It’s the fattest one,” he continued as students found the correct string. “I’m going to play it two times, and then you be my echo and play after me,” Pelausa instructed. The class “echoes” their teacher with some variety in the sounds. “Yes!” is the resounding answer from the fifth-graders. Pelausa plans to put together an ensemble of student ukulele players. In the meantime, he hopes to incorporate ukuleles in the school’s strings musical performance this spring. Chorus students may be involved as well. Students are eager to build skills and advance their learning. Ray’s classmate Sophie has some experience with the instrument because her older sister brought one home from a trip to Hawaii. Pelausa also likes the authenticity he can bring to his lessons.